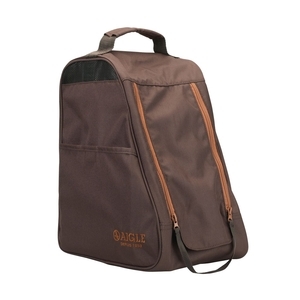 Aigle Rubber Boot Bag. Soft and light coated Oxford fabric. Features vent mesh, reinforced bottom and patch pocket with velcro fastening. Reinforced handle and adjustable strap. Well constructed but for an ankle boot bag it is very tall (almost wellington certainly calf boot) and yet a tight fit for size 10 (uk) walking boots! Nevertheless a good bag. Be careful if like me you have big feet, the opening is too small and the bag is not big enough for size 13 feet!&nbsp;Plenty tall enough its the length and width that too small. Really good ankle boot bag. Very well made! A great buy especially for the price!